There is one main highway in all of Nepal that extends like a crooked z-axis from East to West. In this bus, same as all the others, there is a tissue-paper temple planted on the ample dash that shakes violently and perpetually throughout the 18-hour journey as we climb mountains on four wheels— a steady reminder that even the Hindu God’s are not impenetrable to these conditions. In two-hour increments, the bus sits on its heels in one jerky movement and patrons scatter out the folding door with fire-drill like urgency. It’s next to a field, always, and only sometimes are there trees. Men go in one direction, and the women choose the opposite accordingly. In militant lines, you squat, staring vacantly in front of you. Shake, stand, finish. 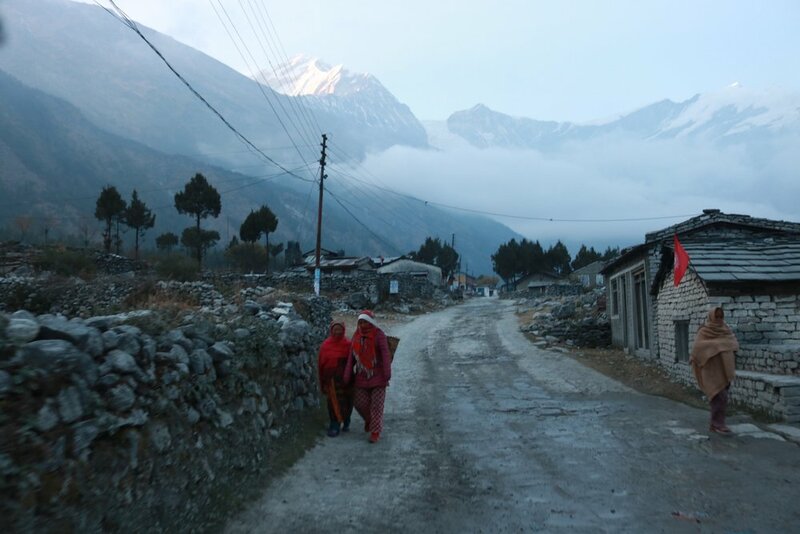 The roads in Nepal are all-encompassing and wholly representative of the conditions one is to encounter and endure in the country. It all happens here. Tires blow, cows cross in front of revving engines, slamming heads into the seats in front of them, drivers cackle at the impossibility of it all. “Why is he laughing?” I asked the three Nepali boys half sitting on my lap in a shared jeep ride meant for 4, holding 10, counting the one hanging on the bumper, plus the loner on the roof. There’s a spider web crack across the whole windshield where, I’m told, the man on the roof fell off earlier that day. “He says this is the scariest part,” one translated as fog descended and we drive down what I’d never before consider a road, rather a tough hiking trail. We’re in the Himalayas. This is my introduction to Nepal, where I first learn that safety is subjective. 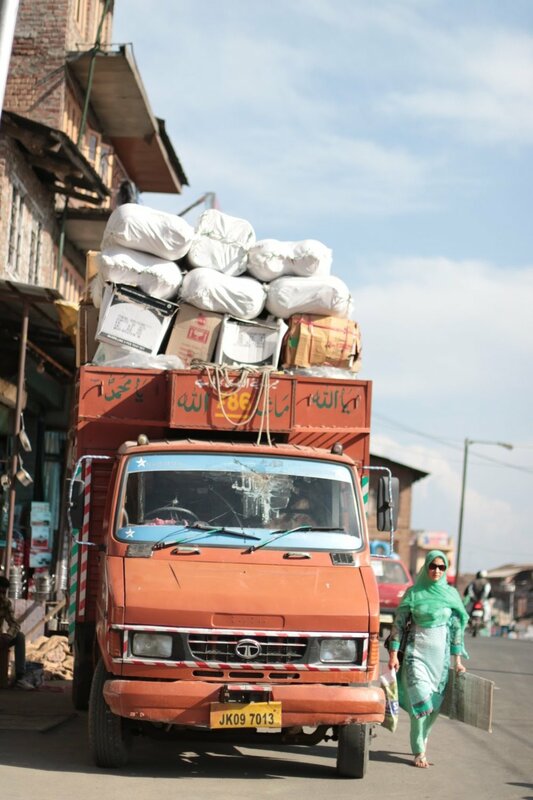 My photo essay highlights the many differences in safety between the East and West— from prevention, to sanitation, to working conditions— that all tell the story of what I would sum up as “making it work” in Nepal and India. Traveling by road in these two countries for the past eight months, these photos have helped me to translate the multidimensional hustle of just that. I’m Jenna, an American expat who has been living and traveling in Asia for nearly two years. I spent all of 2017 teaching English in South Korea, then four months in Nepal as a freelance journalist, and am now in India with a really heavy backpack. I define myself as a travel journalist, but I’m not sure if that’s a thing. What brought you to Nepal and India? What regions did you visit? I originally came to Nepal to pursue journalism, which I studied in university, and found the opportunity online to do so in Eastern Nepal. I lived at a male drug rehab center for four months, where I (first) covered substance abuse. Since I was living 20 minutes from the border to West Bengal, too close not to eventually relent, in January I traveled to India, too. Though I went on two big trips in Nepal, I spent the majority of my time rooted in the Jhapa district, reporting. During their Diwali festival, I hiked to Annapurna base camp from Pokhara. Later, I went on an extended road trip from Jhapa to Kathmandu by motorbike with a friend, and from there we drove up to the Himalayan region of Mustang. On the way home, we also stopped by Lumbini, the birthplace of Buddha, and Chitwan National Park. In India I moved around a lot more, and have seen a lot of a country that varies so drastically state to state. I began across the Nepali border to West Bengal, stayed in a monastery in Sikkim, saw the Ganges in Varanasi, went to Agra and all over Rajasthan, Punjab, Himachal Pradesh, Gujarat, Mumbai, Goa, Kerala, Delhi, Kashmir, and finally Uttarakhand. I think my photography follows my general style of traveling, which is grounded in ‘local’. I stay with locals (as I did in Nepal) and I Couchsurf, as I’ve done exclusively in India, so in a lot of my shots you get candid life, and more often than not it’s because I avoid tourist watering holes and ask my hosts to take me to their local market, eatery, gypsy encampment, etc. I love portraits and everyday life shots, because I give most of my attention to the people and the spirit of a place. Tell us about your experience as a freelance journalist. What advice would you give to others who are interested in doing something similar? It almost feels fake to call myself a travel journalist because it has been such inconsistent and non-lucrative work. In freelance, you make your own success. It is the onus of the writer to seek out stories, research publications, formulate a pitch, and follow through on a deadline. There’s money in it if you’re proactive, but even then, sometimes you’ll find you’re doing a lot of work for portfolio building. I built up a savings teaching English, so I haven’t been relying on the very little income I’ve accrued through my writing. You’ll make more money reporting for an international publication. Publications like Al Jazeera, BBC travel, and Roads & Kingdoms, are always accepting pitches from freelancers if you package the right story. It’s also about being strategic. I moved to Nepal knowing I’d be living virtually for free as a volunteer. After I made myself at home there, I was comfortable to reach out to the English speaking newspapers in Kathmandu to sell a few stories I wanted to cover in my district. Also, know the demand of where you’re going. I met with an AFP bureau chief in Kathmandu, and she told me if she were doing it now, she’d move to Yangon, where the Rohingya refugee crisis is generating work that’s in high demand. Please share the story behind your favorite image that you captured on this trip. I love the image of the Bhutanese refugee children seesawing on a makeshift fallen tree using branches, because it encompasses the theme of my photo essay so well. Western mothers might cringe at this image (and it’s true, a fallen tree struck a man dead in this camp last year, I’m told), but look at those smiles. 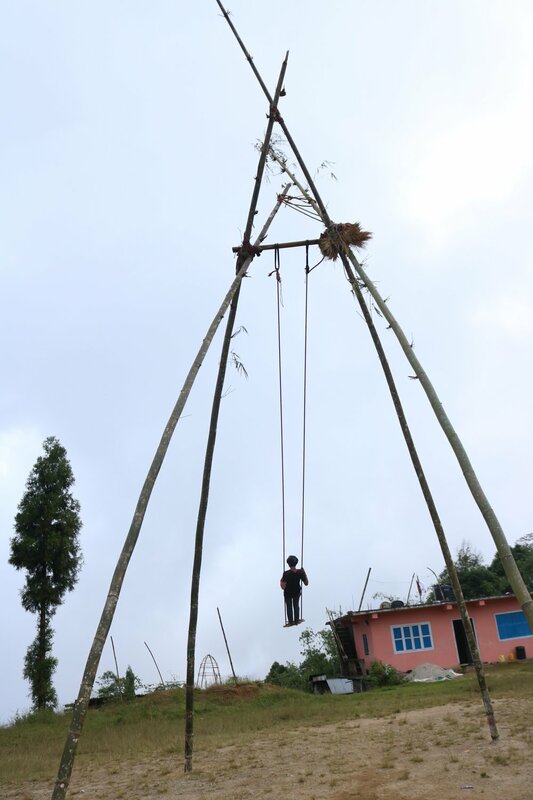 These Bhutanese refugee children are makin’ it work with extreme resourcefulness and I think it brings to light the idea that western standards of ‘safety’ aren’t inherently better. What are some must-see spots in Nepal (places to go, foods to eat, experiences to have etc.)? Stay with local families (using Couchsurfing or Workaway), they will bring you to the heart of it all. My biggest words of advice for Nepal would be to get out of Kathmandu and Pokhara. So many tourists come to Nepal for the trekking, and understandably so, but those beaten down paths are not where you’ll encounter the heart of the Nepali spirit. Though the Himalayas are unspeakably beautiful, it’s almost like you have to sacrifice one or the other, you can’t have both natural beauty and true culture at once. Ilam, a southern region known for its tea fields, is maybe the closest you’ll come to finding a coexistence of the two. The most dynamic landscapes I saw in Nepal were in Lower Mustang, a region that borders Tibet and contains some of the world’s last remaining Tibetan culture. 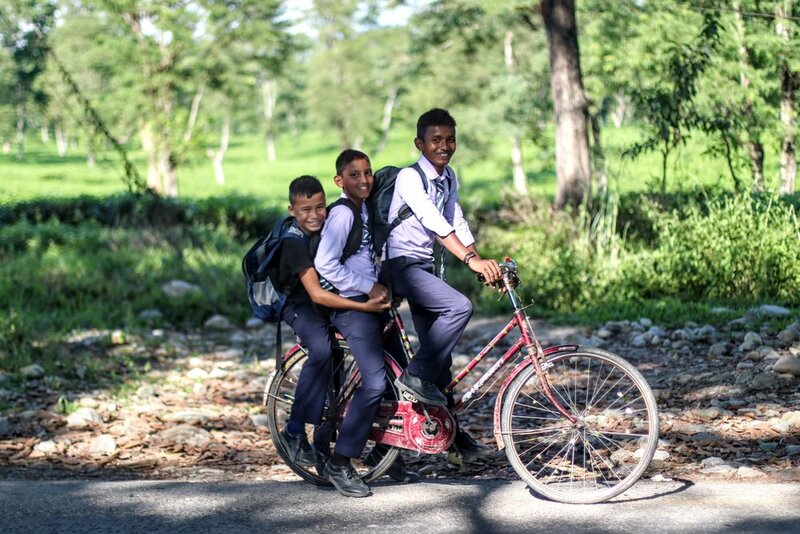 From Pokhara, the ride takes 2-3 days going up, and the landscape changes nearly every hour. You could fly to Jomsom and take a bus to Mustang, but the ride was the best part of the trip. Try yak cheese! I’d really recommend being in Nepal for Diwali and Tihar, two big festivals in the month of October. Their traditions of giving blessings, playing card games, and dancing “dosey” until early morning for neighbors in huge groups are typical and special Nepali traditions. Couchsurfing in India has taught me everything I know about Hindus, Sikhs, Buddhists (from Nepal), and Muslims, which is really so much more specific than “Indians.” Some unique places I visited in India were: first, a region of Wayanad, Kerala, which is painted with coffee plantations, tea fields, and indigenous tribal people. In Rajasthan, I liked Bundi, a city South of Jaipur, which had what I thought was the best fort (along with Amber Fort) in all of Rajasthan because of the stunning paintings inside. And I saw a lot of forts! I volunteered for a waste initiative NGO for a week in Dharamshala, Himachal Pradesh, where I helped pick up trash in the Himalayas with many other international volunteers. In India, it’s horrifying to see cows feasting on trash piles and the laissez faire attitude many Indians have towards proper disposal, so it felt empowering to take some action. Kashmir. My dad’s right, it can be dangerous, but tourists are almost never involved in disputes between locals and the Indian army, and the hospitality of the Kashmiri is something special. I stayed with three different local families, ate meat for almost the first time in India, and was dressed in hijabs and the local dress of my hosts. Kashmiris have an identity separate from India that is closer to Persian, which makes it fascinating. See a Bollywood movie anywhere in India. It’s akin to being in a sports stadium in America, and Bollywood acting is so dramatic, your understanding will not be lost. What are some challenges you faced on this trip and how did you overcome them? Navigating the loss of basic comforts, at first. I was expecting that, that was even my aim in choosing these regions of the world, but certain things still come as unexpected and uncomfortable difficulties. Something I never got used to was having my period in a country where trash cans are hard to come by and waste is lit on fire as means of disposal. I always carried around plastic bags with me to put garbage in until I could find a proper trash pile. In India, I’ve rarely been without proper facilities, and my challenge has shifted to the attention I receive as a single white female. The self actualization that came with being bombarded by Indians wanting to take photos with and of me— and I don’t mean just men— hit me hard. Once the fun of the fame wore off, I realized that consenting to a photo meant validating myself as something worth photographing: something white and, synonymously to them, something beautiful. It also sometimes led to something seedy with the men, who would take the agreement of a photo as consent to put their arms tightly around me or on my lower back. So I stopped. I say “no, thank you,” and smile. This also overlaps with feeling really, really tired of being ogled at all times. I have this sense that I am always on stage, but in this way where I’m treated like an alien that doesn’t understand body language, react to stares, and couldn’t possibly have one thing in common with a local Indian. There are not many tips for escaping this differential treatment, except doing your best not to bring unwanted attention to yourself, and dressing like a local. The feeling goes from moderately uncomfortable to absolutely unbearable if you’re not covering your shoulders, chest, and legs. How did your experiences in Nepal and India change you? I learned how to do the most basic human things all over again and in their simplest form. I learned the utility of my own hands, to complete a task like eating the twice a day “dal bhat” using just my right hand as a spoon to scoop the rice and lentils into my mouth. I learned how to substitute water for toilet paper and how to scrub sweat out of clothing using a plastic bag on the floor outside, soap, and well water. Gradually, I learned how to communicate basic needs and emotions in Nepali, if only just to see the utter joy it brings to them. I think if you can adjust to living with close to nothing but basic facilities and good company, you become invincible. Nepal served as my training wheels for India. Although India is a much larger country that’s statistically less safe, notably for young women, I was emboldened by my positive experiences in Nepal. How India impacted me was built off of how Nepal first re-educated me. I had changed the way I dressed and even how I spoke to strangers (less exuberantly, especially to men who misinterpret that). Since I had a head start in cultural immersion, I was able to better examine differences between Nepal and India, and India and the West. 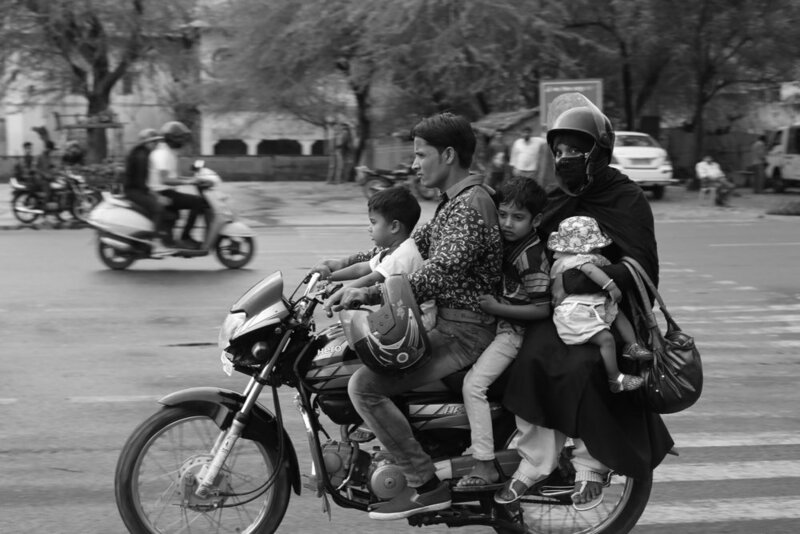 I saw a much larger societal gap in India— monster wealth in Mumbai and in Kashmir and desperate poverty in the dunes of Jaisalmer and outskirts of Haridwar— and changed a lot of my Western ideas about India being a poverty-stricken nation without basic facilities— India has everything the West has. I’m going home! That’s the first time I’ve said that in two years! My brother is getting married this summer, which is the necessary catalyst after such a long hiatus from America. I’m still not ready to live there, though, so after this summer, I’d like to go abroad again and learn a second language.